Includes all cable and connectors. The Flexi PV range of is a tough, fully weather resistant flexible solar panel designed for use in the harshest environmental conditions. Suitable for permanent fixing or stand alone use, the 10wp Flexi PV kit is ideal for battery maintenance, camping / caravanning, electric fence power and many more applications. 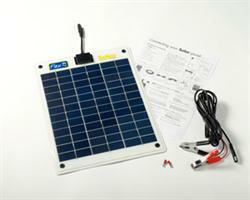 PLEASE NOTE: The 10W panel kit does not require a charge controller if the battery to be used is larger than 75Ah. The typical Daily performance of the solar panel in peak conditions: 4.41amp-hours per day. Operating range of between -25 to +80 deg C.
Buying this product will earn 1072 Loyalty Points. Be the first to submit a review for the FLEXI PV 10W Flexible Solar Panel Kit.